Apart of the new guard of Cru Beaujolais! In 2014, Anthony acquired a plot in Côte du Py, Morgon. This sub-region is in the heart of Beaujolais and widely considered one of the true jewels of Beaujolais. 2015 saw Anthony add to his holdings by securing a 0.7ha patch of Beaujolais-Villages and in 2017 he started farming 2.5ha of Chénas. True to his teachings, Anthony works organically throughout his vineyards with no trace of chemical inputs. The landscape is largely of iron-rich sand and granite, locally known as "roche pourrie" a.k.a “rotten rocks”. Although these are shallow soils, the vines dig deep to find moisture and as such are all dry grown, with no irrigation. The yield, age and health of these vines are testament to the care they receive from Thévenet, who meticulously tends to them by hand, tilling the soil himself. 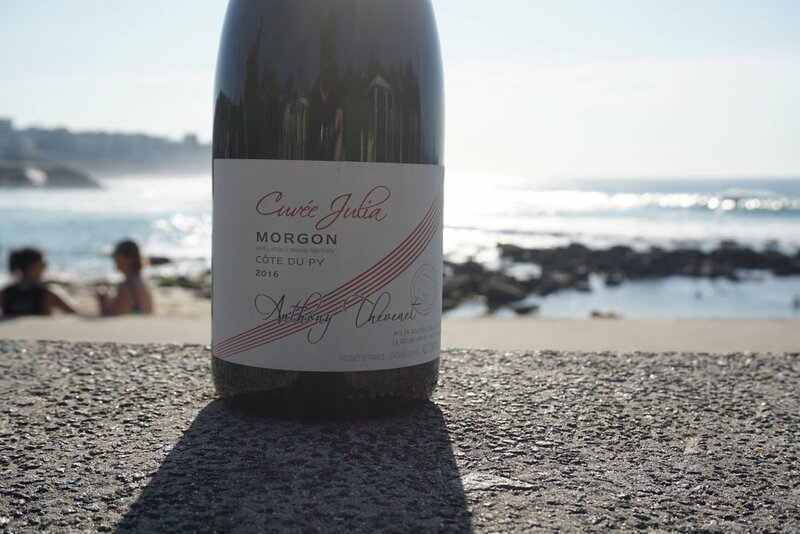 'Cuvée Julia' sees its 2nd vintage in 2016. Named after Anthony's first daughter who was born the same year of Thévenet's first release from the famed Cote du Py. Elevated at 260m on crumbling granite and schist soils, Gamay is again picked as bunches for carbonic maceration of 20 days in concrete vats, here it completes full natural malolactic fermentation. The resulting wine is aged in old 225L Hogsheads for 7 months before being sent to bottle without fining, filtration and finished with less that 10mg/l of SO2 added. Handpicked as bunches from his late grandfather's old vines from an elevation of 250m on sandy soils with schist and blue granite. Gravity fed to concrete vats for a carbonic maceration of 20 days, here it completes full natural malolactic fermentation. The resulting wine is matured in old 225L Hogsheads for 7 months before being sent to bottle without fining, filtration and finished with less that 10mg/l of SO2.